Great for all occasions, these inspired Murano glass letter openers are a great way to thank your guests for sharing in your special day! 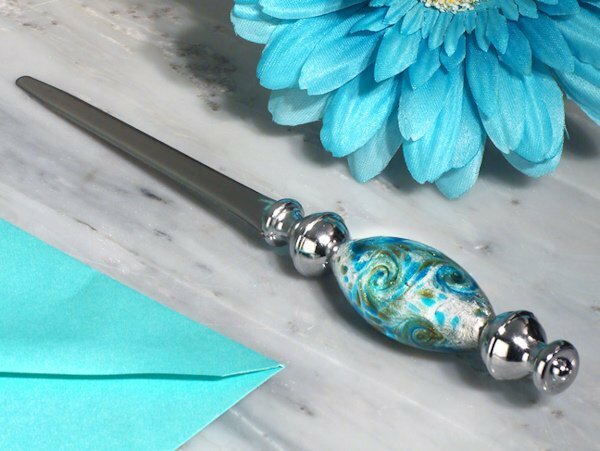 Our 7" letter openers offer a stunning designed Murano-inspired glass charm featuring a beautiful teal blue and silver swirl style with gold accents on the chrome metal opener's handle. They each are nicely packaged in a white gift box that is lined with satin. Could the murano letter openers be put in small boxes for an additional charge? I'm sorry, we're unable to alter this Murano Glass Letter Openers - Art Silver and Teal at all from how they're described/shown on our site since they're shipped directly from the manufacturer. They will arrive nicely packaged in a white gift box that is lined with satin. I want to order the teal letter openers, but need to know if can they be personalized? Can these be engraved by you? Does the Letter opener comes in a gift box? Yes, the Murano Glass Letter Opener - Art Silver and Teal is nicely packaged in a white gift box that is lined with satin.